A South Korean parliamentary probe into a corruption scandal engulfing President Park Geun-Hye sought Wednesday to compel the woman in the eye of the storm to answer questions after she rejected a summons. Choi Soon-Sil, a close friend of Park, has been charged with meddling in state affairs and using her presidential connections to force dozens of conglomerates to donate tens of millions of dollars to two foundations she controlled. Choi was among a handful of key witnesses who rejected a summons to appear Wednesday before the parliamentary committee investigating the scandal. The reasons she offered — health issues and the need to prepare for her upcoming trial — were rejected by the committee chairman Kim Sung-Tae. “This hearing is being criticised as a Choi Soon-Sil trial without Choi Soon-Sil,” Kim said. “We will undertake all measures to make them appear,” Kim said, referring to Choi, some of her family members and close associates, as well as some former officials from the presidential Blue House. Half of the witness seats at the hearing were empty. On Kim’s direction, a group of around 20 men in dark suits and matching ties came forward and were handed envelopes with the names of the absent witnesses. He instructed them to bring the witnesses to the National Assembly by the beginning of the afternoon session, and added that any who refused would be held in contempt and punished. Non-compliance can carry a maximum five-year prison term. 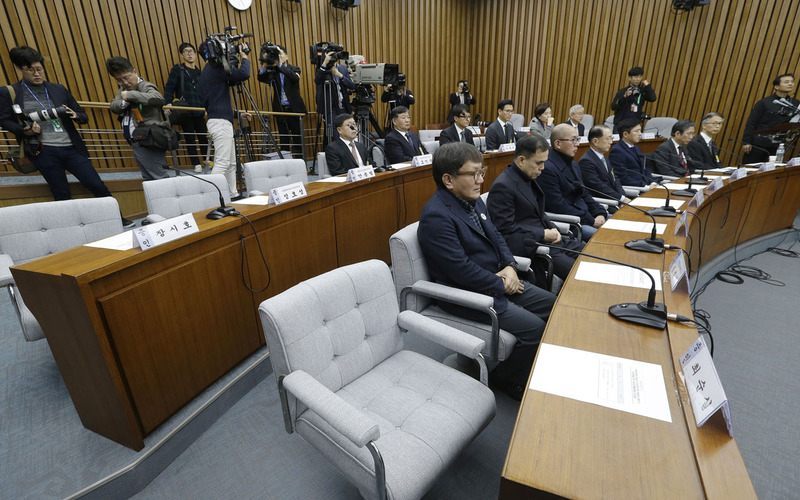 But by the time the afternoon session began, Choi’s seat remained empty with only her niece turning up to face questioning. Wednesday’s morning session largely focused on former Blue House chief of staff Kim Ki-Choon, with lawmakers seeking clarification on the influence Choi wielded over Park. On Tuesday, the committee had grilled the heads of the country’s eight largest conglomerates over donations they made to two dubious foundations controlled by Choi. The session was televised live and millions watched in astonishment as some of the country’s wealthiest and most powerful men were publicly hauled over the coals and accused of shoddy business practices.